CIO Review magazine has published article on Linguifying “E-Governance Services and Enterprise Application” in June – 2018 issue. It is for providing multilingual services to government and public sector enterprises to reach out to the common man in their local language. The article talks about Linguasol – a group company of Fidel Softech. CIO Review is a leading technology magazine which talks about the enterprise solutions that can redefine the business goals of upcoming enterprises. It is a sensational platform for enterprises to showcase their innovative solutions. In India, many times we see that, there is a vacuum among entrepreneurs of enterprise startups. CIO review will help to reduce this gap by helping business leaders with analysis on information technology trends and gives a better understanding of the role that enterprise solutions play in achieving the business goals. It also gives companies a heads up on the innovative solutions that the startups are working on, what are the needs that haven’t been met yet and more. 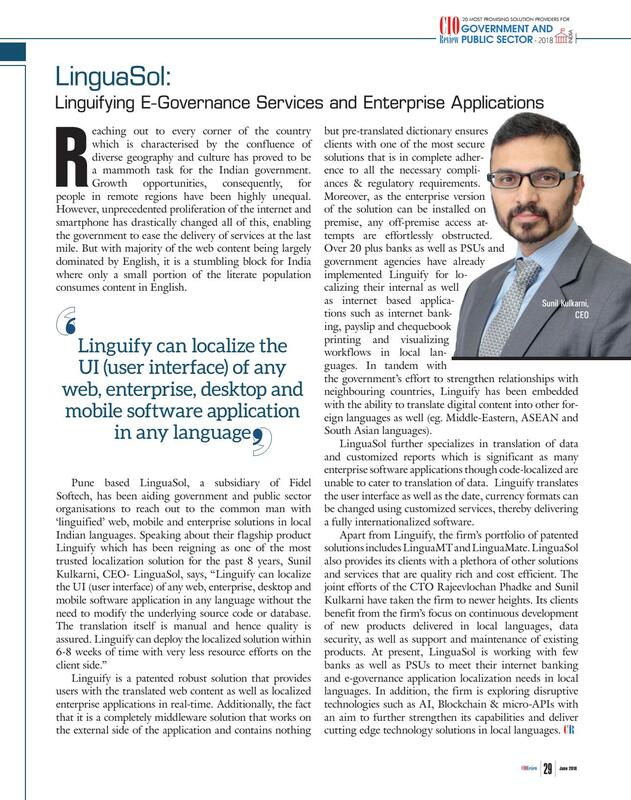 Linguasol – is aiding government and public sector organizations to reach out to common man with ‘Linguified’ web, mobile and enterprise solutions in local Indian Languages. Linguify can localize the UI (User Interface) of any web, enterprise, desktop and mobile software applications in any language without the need to modify the underlying source code or database. This is making customers of Linguasol happy and satisfied. Over 20 plus banks as well as PSU’s and government agencies have already implemented Linguify for localizing internal as well as internet based applications such as internet banking, pay slip, checkbook printing and visualizing workflows in local languages. Linguify has been embedded with the ability to translate digital content into other foreign languages as well; this helps Indian Government’s effort to strengthen the relationships with neighboring countries. At present, Linguasol is working with few banks such as PSUs to meet their internet banking and e-governance application. Along with this, firm is exploring technologies such as AI, Blockchain and micro-APIs. The joint efforts of the CTO Rajeevlochan Phadke and Sunil Kulkarni have taken the firm to newer heights.